If you made a list of the weird and beautiful life forms that are going to be in deep trouble after another couple decades of climate change, Joshua trees would be somewhere near the top. Yucca brevifolia, as they’re technically known, are desert plants — the biggest, twistiest, spikiest thing growing in most of the Mojave Desert — but they’re already struggling in a warmer, drier world. In Joshua Tree National Park, at the southern edge of the trees’ range, Joshua tree seedlings are a rare sight. The arrival of winter rain and snow, the major source of water for the Mojave, is more and more erratic, and brushfires have become more likely, spread by carpets of introduced grasses that easily rebound after burns that reduce Joshua tree groves to blackened twigs. Projections for future climate scenarios suggest that, by the year 2100, the ideal place to be a Joshua tree will be somewhere in Idaho. The trees aren’t likely to get there on their own. Joshua tree seeds are borne in fleshy green fruits that are eaten by everything from insects to crows. The only critters that carry the seeds any significant distance are packrats, which typically cache seeds a few dozen meters from the tree where they find them. But thousands of years ago there was a better option: giant ground sloths. During the last ice age, the sloths roamed the territory that would become the Mojave, and they ate Joshua tree fruit — we know this because Joshua tree seeds turn up in preserved sloth dung. Then the ice age ended and humans arrived and, caught between the changing climate and the new, tool-using predators, the ground sloths went extinct. So now people who care about Joshua trees, like conservation biologists, talk seriously about “assisted migration” to transplant the trees to more suitable climates. But what if we could bring back those sloths? Whether the prospect of resurrecting nine-foot-tall sloths to roam the deserts of Southern California makes you roll your eyes or stand up and cheer for the triumph of science, you have probably previewed your own reaction to Beth Shapiro’s new book, How to Clone a Mammoth: The Science of De-Extinction. As is obvious from her title, Shapiro, a paleobiologist at the University of California Santa Cruz, sets her sights on bigger game than ground sloths: wooly mammoths, the brontosaurus of the ice age. Her arguments in favor of the resurrection — she calls it “de-extinction” — of some of the largest land mammals in history touch on all of the issues raised by the case of the Joshua tree and the giant sloth: How can we best manage a biological world that is, more and more, at the mercy of our whims and carelessness? Is conservation best served by doing what we can do right now to patch over our mistakes, or by moon-shot projects that reshape the terms of the problem? What does “conservation” even mean? A surprisingly large portion of How to Clone a Mammoth is devoted to explaining how impossible it really would be to clone a mammoth from fortuitously preserved DNA, á la Jurassic Park. Shapiro’s scientific bread and butter is using “ancient DNA” to reconstruct the evolutionary history of both living and extinct species, and she certainly knows the limits of our capacity to reassemble genetic sequences from bits of tissue preserved in permafrost or dry desert caves. DNA decays into unusably small fragments at a fairly predictable rate, but mammoths, the last of which may have died out as recently as four thousand years ago, are within the age range at which it is possible to extract usable genetic sequences. It is even possible to reconstruct a reasonable approximation of a whole mammoth genome sequence; Shapiro and her collaborators have done this. However, that reconstruction work still has so many gaps and approximations that it would almost certainly not produce a living mammoth, even if we had a reliable way to feed it into an egg cell and get that to develop into a viable embryo. Shapiro is much more confident about an alternative approach, which is to reverse-engineer a mammoth from its closest living relative, the Asian elephant. Emerging technologies let geneticists compare the best-available reconstruction of a mammoth genome to that of living elephants, identify stretches of DNA sequence where they differ, and then systematically engineer changes in the DNA of an elephant embryo to match the mammoth. The result, implanted in an elephant’s womb and brought to term, would be, arguably, more elephant than mammoth. However, Shapiro’s concept of de-extinction does not require the creation of an animal with the same genome sequence as the thing we want to resurrect. Her goal, instead, is ecological de-extinction — the creation of a creature that can fill the same role as a mammoth in a larger biological community. Shapiro frames mammoth resurrection, or de-extinction, or recreation, or whatever this would be, as part of a broader effort called “Pleistocene rewilding.” The idea is not to put recreated mammoths in zoos — it is to release them into wilderness preserves in Europe, Asia, and North America, as part of re-establishing the community of large animals that lived in those regions during the last ice age, the geological era called the Pleistocene. At the time, the Americas, Europe, and Asia looked rather more like modern Africa, with many more species of large herbivores and their predators — saber-toothed cats, dire wolves, wooly rhinoceroses, and more. As originally conceived, Pleistocene rewilding would try to re-create those “megafauna” communities using similar, non-extinct species: camels and horses to flesh out the herbivore community, cheetahs and lions to replace extinct predators, even an endangered giant tortoise from Mexico — and, in the absence of mammoths, Asian elephants. Around 11,000 years ago, coincident with the arrival of big-game hunters, massive extinction was underway. The survivors — deer, antelope, wapiti [elk], musk oxen, caribou, moose, pronghorn, mountain goats, mountain sheep, and bison — represent only 30% of the big-game fauna present earlier. Despite the addition of domestic cattle, sheep, and goats, there is reason to suspect that numerous “empty niches” or “job opportunities” persist on the American range. For years, Martin built his case, studying the ecological functions large herbivores had performed during the Pleistocene, but the idea of rewilding didn’t really take off until he and a number of coauthors published a brief on their proposal in a 2005 article for the Nature magazine. Martin and other proponents of Pleistocene rewilding argue that it could provide new habitat for megafauna species that are critically endangered in their native ranges, like lions and rhinoceros, and that it would have significant benefits for the health of the ecosystems into which they are introduced. Many American tree species, not just the Joshua tree, grow fruit that probably evolved for distribution by seed dispersers long since extinct; plants like creosote bush, which are mostly ignored by rangeland cattle, could be better managed, maybe, by browsing camels; and Pronghorn antelope, the fastest mammals in the Americas, which used to run from Ice Age cheetahs, could be prey for modern ones. More generally, putting big carnivores back in place would reduce the overpopulation of species like whitetail deer, which are so numerous in the forests of North America as to reshape the list of plants that can grow there. Martin, Shapiro, and their collaborators seem confident that the humans who like to hunt those deer, and who live at the edge of those forests, would not have any lasting objection to new carnivorous neighbors. The best match for this kind of ecological optimism is, perhaps unsurprisingly, in science fiction. Kim Stanley Robinson’s novel 2312 describes a far future in which humanity has colonized the Solar System in large part thanks to an understanding of genetics and ecology that enables us to assemble whole artificial ecosystems under domes and inside hollowed-out asteroids, even as Planet Earth has been dramatically changed by more than five centuries of industrial climate change and overpopulation. (Robinson imagines Florida entirely underwater, and Manhattan transformed into something like Venice with skyscrapers, and doesn’t make either of those developments out to be total tragedies.) At the climax of the story, the space-faring portion of humanity parachutes millions of animals — wolves, rabbits, lions, eagles, water buffalo, flamingoes — in from orbit to kick-start the restoration of the Earth. It’s a beautiful, surreal, set-piece — and it is about as believable, to anyone with any expertise in ecology, as faster-than-light travel must be to a working physicist. Pleistocene rewilding wouldn’t air-drop mammoths into Montana. And, in the most charming stretches of How to Clone a Mammoth, it is tempting to think that de-extinction differs from other radical plans to patch up the mess we’ve made of the planet only in degree. There is already a major project underway to restore the American chestnut tree, a beautiful and ecologically important species that was widespread in the eastern United States until it was wiped out by an infectious fungus we accidentally introduced from Asia. Scientists working with the American Chestnut Foundation have bred chestnut seedlings that resist the blight, and plans to plant them across the tree’s former range. That right there is genetic engineering to restore a species that is effectively extinct in the wild, if only for less than a century. But the difference between the chestnut tree and the mammoth is an enormous one, and not just because of taxonomy. It isn’t breeding a disease-resistant tree to grace parks and suburban neighborhoods, which is the kind of thing we’ve done almost since we learned how seeds worked. Shapiro and her collaborators want to use brand-new genetic methods to re-create a creature we’ve never seen alive, and then release it into our best approximation of a habitat that hasn’t existed in twelve thousand years. That will take a commitment of millions, probably billions of dollars in technology and scientific brainpower and land purchases — resources that could go toward securing better habitat and protection for species that are alive and threatened right now, including the elephants who would provide the tissue samples and cell cultures and wombs for the de-extinction of the mammoth. Moreover, we can’t truly know how mammoths would fare in the modern world. Living communities are complex webs of interactions we rarely understand with any confidence, and we already have a history of introducing large (or at least mid-sized) mammals into new habitats, with decidedly mixed results, overall. Horses went extinct in North America along with the rest of the Pleistocene megafauna; they were brought back by European settlers, escaped, and now there are more-or-less wild herds out on the range. It isn’t clear, however, that horses improve the diversity of plants or other animals in these new habitats; ranchers regard them as pests and competitors for cattle. Camels, too, ranged in Pleistocene North America before humans arrived — but when a number escaped after a pre-Civil War U.S. Army experiment in using them for transportation, they didn’t establish a self-sustaining population. Then there are gray wolves, which were largely eliminated in the lower forty-eight states in the first half of the twentieth century, then reintroduced into Yellowstone National Park, with careful monitoring, in the mid-nineties. Though the latest data suggest the wolves didn’t have as great an effect as initially reported, they may have helped to restore a plant community over-browsed by elk. However, wolves moving out of the park, and recovering wolf populations elsewhere in the U.S., have met with anything but a warm welcome from the human population. Under rationales ranging from protecting livestock to reducing predation on deer and other game animals, wolf-hosting states from hyper-conservative Idaho to deep-blue Minnesota have lobbied for, and acquired, exemptions from the wolf’s protection under the Endangered Species Act, and swiftly established hunting seasons. (The third wolf season in Minnesota, Wisconsin, and Michigan has been stopped by a court challenge.) Mammoths aren’t predators, of course, but how many times would they have to wander into cornfields before they met the full fury of the American agricultural lobby? Or, even before that, consider that every mammoth created by the methods Shapiro describes would literally be a tusked, ten-foot-tall, multi-ton GMO. Just weeks ago, George Church, the Harvard geneticist leading the charge on the gene-editing de-extinction approach, announced that his lab has successfully inserted mammoth DNA sequences into living elephant cells. This development has not passed review at a scientific journal, so it may be premature, but it reinforces the fact that there are some very smart people with the resources and the motivation to take the first steps toward a living, reconstructed mammoth. Sergey Zimov, a Russian geophysicist who makes several appearances in How to Clone a Mammoth, has been stocking a preserve in Siberia with wild horses, bison, musk oxen, and moose since 1989. Whether or not this preserve — which is called, yes, Pleistocene Park — is an accurate re-creation of mammoth habitat, it stands ready for an elephantine main attraction. As for the enormous amounts of money required to build from gene-edited cells to mammoths alive on the range: billionaires regularly make hobbies of designing tourist spacecraft and colonizing Mars. Since Mars is claimed, why not finance the resurrection of a gigantic extinct animal instead? 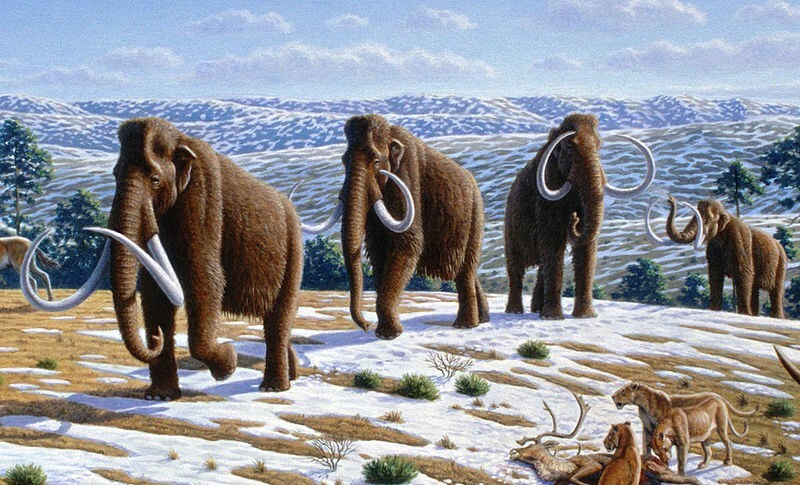 If How to Clone a Mammoth doesn’t necessarily convince the reader that de-extinction is a good idea, it does leave a strong impression that mammoths, or mammoth-like things, are on their way regardless. For all her optimistic tone in the rest of the text, Shapiro gives the book a sobering dedication: “For my children, James and Henry, who will inherit whatever mess we make.” Humans have been altering the planet since the days when mammoths still roamed the steppes. More often than not, we did so without really meaning to, or knowing what kind of world our changes would create. De-extinction and rewilding, whatever their actual scientific merits, offer a vision of the future in which we admit that we’re in the planetary driver’s seat, and actually start to use the steering wheel. It’s not hard to see the appeal of that vision. But even without the genetic engineering, Pleistocene rewilding is a dramatic reframing of what it means to conserve nature. It’s not just trying to save the living things that are here right now, but trying to restore a world from some time before humans influenced the course of planetary events. Shapiro writes, “De-extinction is a process that allows us to actively create a future that is really better than today, not just one that is less bad than what we anticipate.” Why is a reconstructed Pleistocene “a future that is really better than today?” That remains unclear — except that it is the most distant slice of Earth’s past from which we can obtain the preserved DNA necessary for de-extinction, and during which modern humans were anywhere on the global stage. There are many more differences between the Pleistocene world and the modern one than the absence of mammoths and ground sloths. The Pleistocene megafauna coexisted with humans for a time, and in that time the world was greener, and maybe, in many respects, a better place. At that time there were also a lot fewer than seven billion of us. Pleistocene rewilding carries a strong smell of the same nostalgia for a vanished epoch that has young urban professionals trying to re-create the lifestyle of ancient hunter-gatherers in organic grocery stores and exercise studios — a paleo diet for the entire planet.